The Problem Solving Company’s gifted and talented activities offer Primary and Secondary pupils the opportunity to ask questions, discuss ideas, relay opinions and feelings, and thrive on complexity. Whether it be alongside their year group or key stage peers or in a group of exclusively Gifted and Talented pupils, they are given a novel opportunity to develop their talents. We offer schools the opportunity to provide a fresh learning approach geared to ability. This is set beyond the classroom using an outside agency that challenges all learners by enriching the curriculum with extension activities. We have run many Gifted & Talented sessions that are part of cluster days, working with different schools in an area. We have successfully ran some of these where the students help adapt our activities to take back to their school to then run with the pupils back at school. Gifted and Talented Cluster days are a great opportunity for pupils to work with other groups of advanced students they don’t know. Problem Solving at Seaton House School - Gifted and Talented mathematicians come together at Seaton House School. If two heads are better than one, then three schools combing to solve problems has to be a recipe for success. Seaton House School played host to gifted and talented young mathematicians from The Avenue School, Belmont and Barrow Hedges Primary School, Carshalton, for an afternoon of ‘thinking outside the box’ problem solving. 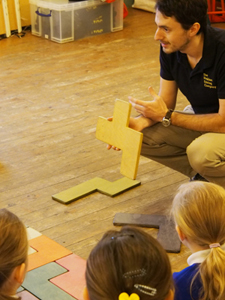 A range of mathematical conundrums were provided by The Problem Solving Company whose specially tailored workshops encourage children to work together. Solving these mathematical dilemmas required open discussion, reasoning and evaluation skills, which all combine to create successful teamwork. At the end of the afternoon, parents from all three schools were invited to see how well their children had co-operated together and benefited from the skills and strengths of each other to reach a common goal.